Today I’m chatting about the easiest decisions, while I muster up the energy to dive into some of the choices that I’m struggling with the most – I’ll really be leaning on your input for the tile and counters! 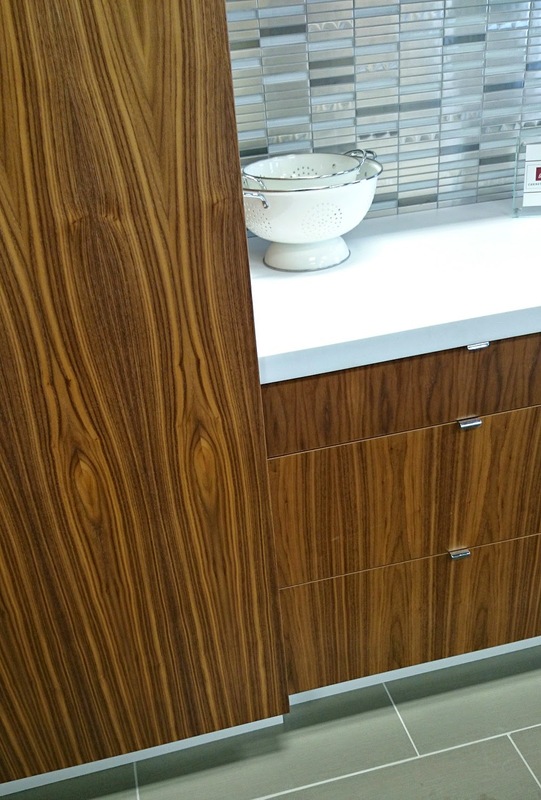 Walnut was my first choice for cabinetry because it’s a classic look, with a slight mid-century modern feel. It will offer a nice, warm complement to the cool aquas and greys I like. I did toy with a pale grey stained maple, a charcoal stained oak, and even a beach glass acrylic, but I always found myself gravitating toward walnut. Full disclosure: there is a little voice inside my head that is chanting “aqua cabinets,” but I have to admit that despite wanting the lakehouse to be our forever home, I still think about re-sale and for any permanent renovations, I feel that same “keep it neutral and boring so it’s sell-able” worry creeping in. Here is the exact cabinetry (in a show kitchen) that sealed the deal for me. (I snapped some quick photos with my phone). Gorgeous grain, right? It’s richer in real life, my camera has bleached and yellowed it a bit. Here’s a fun fact: the range hood is hidden in the cabinetry and pops out when you need it. 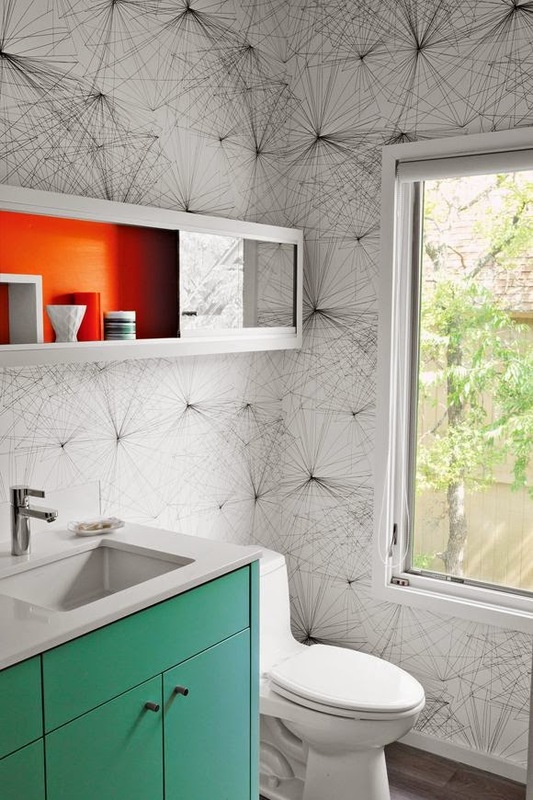 I am definitely filing that idea away for when we renovate the kitchen! Apparently I can order this cabinetry with the grain running horizontally or vertically. (Seriously? More decisions?!?) These cabinets will eat up a huge chunk of our budget, but they’re excellent quality and made to order. 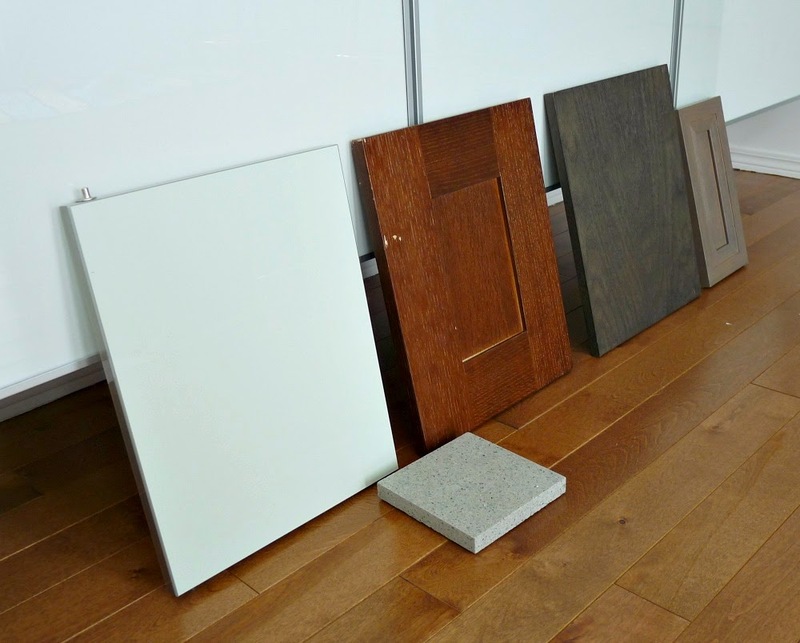 After finding myself disappointed with big box store melamine cabinetry, I’m willing to cut costs elsewhere if it means getting great cabinetry (famous last words). I don’t like the look of a toe kick. It is the weirdest thing to not like, but that’s partly why I chose the vanity we had in the townhouse. It had the option to leave it on legs, so it looked like a piece of furniture. The problem, though, was my excessive cleaning of the floors – which started to wear away the melamine legs (this is a common problem for me, literally washing away finishes). After I opted for the floating credenza in the dining room, Hubby started to mock my love of floating furniture and proposed a floating sofa (it’s not impossible) and a floating bed (ditto). I just think it makes cleaning easier and I like the look. So I decided on a floating vanity for the bathroom. Now I’m thinking that the tower will be on mid-century inspired legs, or maybe a chunky base (I can handle a little toe kick), and the rest of the vanity will be cantilevered out and floating. Sort of the flipped around version of the one below. Faucets are another fairly simple choice, although I find myself waffling on the finish. I am leaning toward Kohler products, especially because they have a few styles of faucets that remind me of the door hardware we have – which still float my boat with their mid-century modern vibe. I like the simple look of these faucets (the Purist widespread, the Purist, and a different Purist widespread). I like the function of a single handle, but prefer the look of two. To have such trite problems really is a luxury. The toilet choice is another no-brainer. I like a skirted trap – I don’t like to see the curvy trap, and that really limits my options (which I appreciate). Before I learned that it’s “skirted,” I referred to it as “a covered poop shoot” – just between Hubs and I – when we were shopping for the townhouse bath reno. A staff member at a home improvement store overheard me and said, “you don’t actually see the poop go through it”. I guess I sound stupid enough to warrant the explanation of this particular detail. 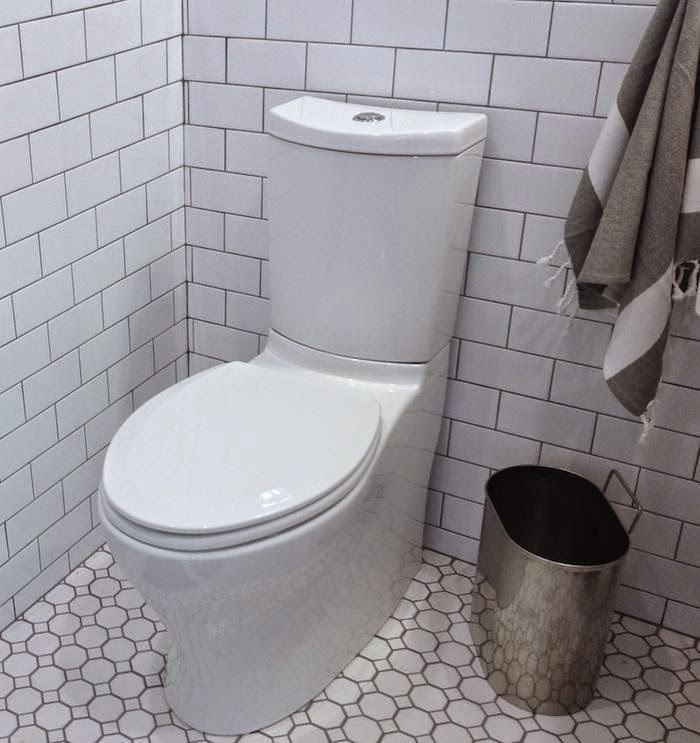 Yes, choosing bathroom fixtures was totally new to me and I didn’t know the proper names for things but I had, in the past, successfully used toilets and was familiar with the general way in which they function. Anyway, this one from Kohler is a beauty – I spotted it in a local shop and loved the stream-lined look. It’s modern, but not too modern. I don’t want it to scream for attention, otherwise guests will be intrigued and want to use our main bathroom, not the guest powder room like they’re supposed to. take a look at Symmons dia fixtures. 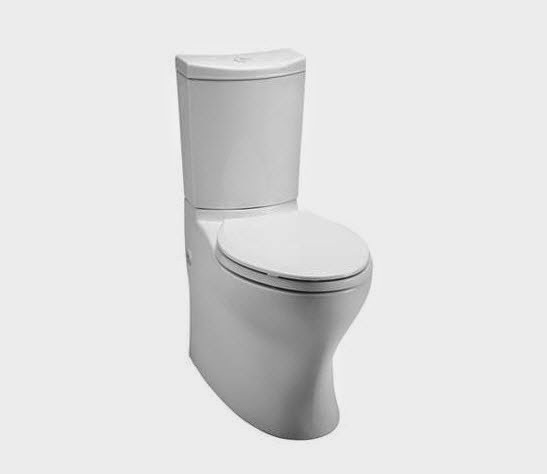 We have a combination of Purist by Kohler and Symmons in our master to save money. They look very similar and pla together well (like our shower valve is symmons but out hydrorail and showerheads are Kohler. Faucets are Symmons but hooks and towel rings Kohler. Normally this sort of thing would drive me batty, but it's really indistinguishable. And saved several thousand overall. 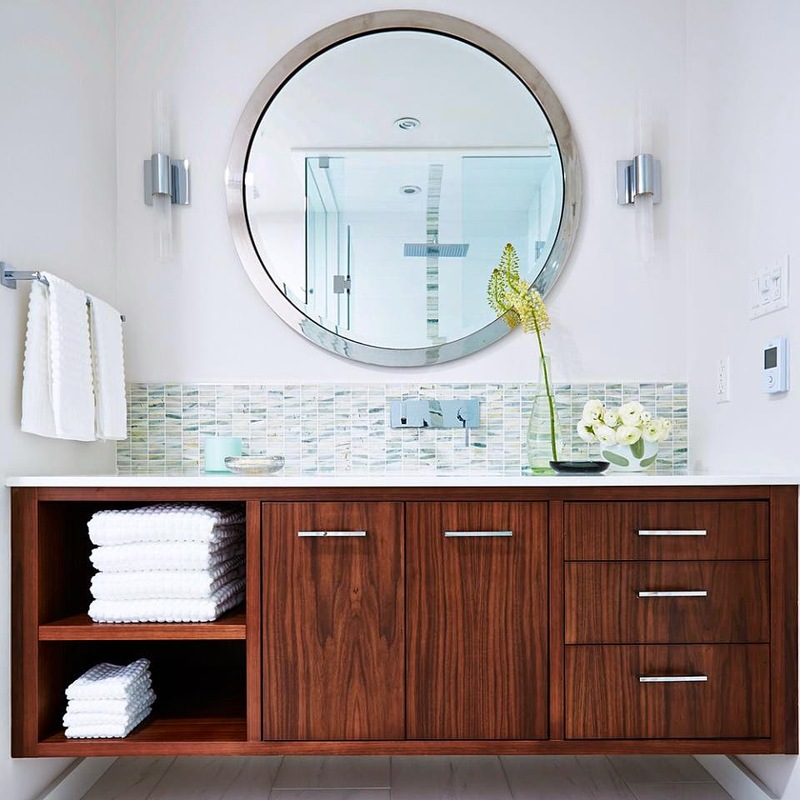 Last;y, we have a walnut floating vanity. We actually had our contractor order a standard vanity frame and then he custom made drawer fronts from hardwood. Cheaper than a walnut vanity and solid wood/no veneers to wear/chip, etc. We went with long wide ceramic plank floors in a dark color (Nero, it was called) and the shower is a tumbled and sealed marble subway tile with white penny tile floor. The thresholds and vanity top (I did not want to worry about etching) are Quartz in a look that mimics carerra marble but is glossy. It works, and it looks a lot like your inspiration photos – especially the one with the round mirror over the vanity. It's like that with darker floor and those same lights over standard medicine cabinets. I had a very hard time picturing how all the tile would work together, but it does and we mainly wanted floors that showed no dirt (after large scale white tile – ugh!) and counters that would last forever. I will take a look at the Symmons fixtures, thanks! I'm guessing you like your Purist fixtures? Your vanity sounds fabulous!! Actually, I'm drooling over your whole bathroom. I definitely want a floor that hides dirt too, because the white tiles in my last kitchen drove me insane. I am considering Quartz but the local dealers say there is a crazy back order on the ones that mimic marble, so I'd have to choose a speckly finish or postpone the reno a great deal. I am leaning toward Quartzite, which I'll share photos of Thursday. I do love the idea of Quartz, though. Thanks so much for sharing details about your space. It sounds gorgeous and has given me some ideas to think about. These are some gorgeous pics! 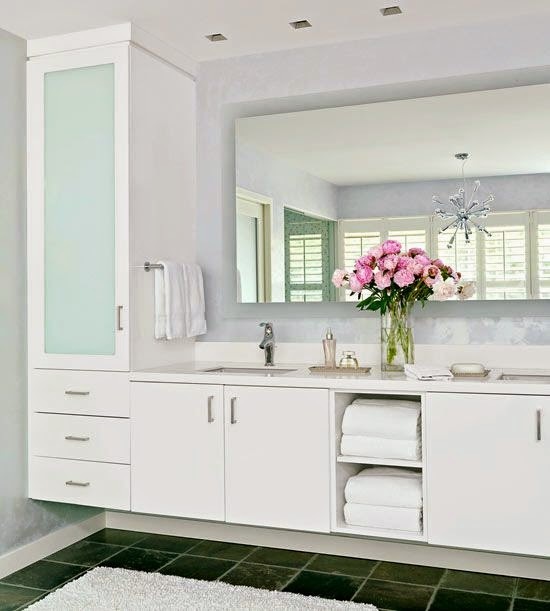 I think I agree with how a linen closet and vanity look when they're both floating…. ehhh! They do all look great though, and your ideas seem like they'll work well together. I love the direction this is going! Happy to hear you love the Kohler Purist! I always like to hear from people who have the products I'm considering.I will definitely check out tablelegs.com, thanks for the link! You and I have such a similar aesthetic, I think. If you like the direction, that I know I'm on the right track! Sometimes it's hard to tease out what works for me and is "my style" from what I just like – because I like so many things.I had a crazy idea after I posted this to float the tower a bit and then float the vanity higher so they don't have that weird one level look, but I still get the ease of cleaning and the look I want. Still pondering the logistics of that, but I have some time.Argh, the faucets! The double tap Purist looks SO good, but I just love the function of the single tap. Wish the single tap was a bit cuter, but then maybe it looks better in real life. The single one is also less expensive, so that's a perk…I totally understand your trap rage. I do not understand why skirted is not the norm! It looks better and is easier to clean. Happy to hear you found a nice one to replace your sneaky bone toilet! 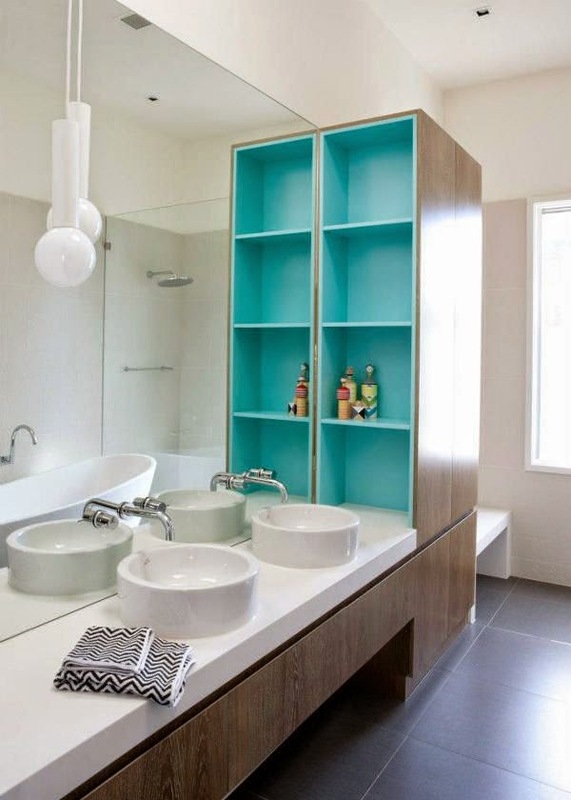 It would be pretty cool the have turquoise on the inside of the cabinets like a little surprise (like in the one pic but with a door).I like the faucets but don't like how is curves on the bottom part of the handle, where it turns from vertical surface to horizontal surface. It would be nicer if it was a sharp 90 degree angle….it that makes sense. Yes, I see what you mean about the angle. I like the two tap models better, but love the function of one tap – especially now that I'm on a water restriction, having the water come on luke warm right away, instead of fiddling with the temperature, seems like a selling point. I am not 100% sold on it, though…There is something I like less about the single tap one. You have such a good eye for detail!I love the idea of aqua insides! Yeah I agree about the 2 knobs vs 1. The 1 knobs always seems kind of industrial to me…something you'd see in an office or mall bathroom, not a home…..but yes it's nice just to just push up one knob and have equal amounts of hot and cold. Wow! Choices, choices. Looks like you have a good start on everything. Great toilet choice. I think skirted is a great idea. I think the color of the cabinet is great. This house is going to be soo beautiful. These have been the easier choices! That's why it seems like I'm on a roll, haha. Happy to hear you like the decisions so far. 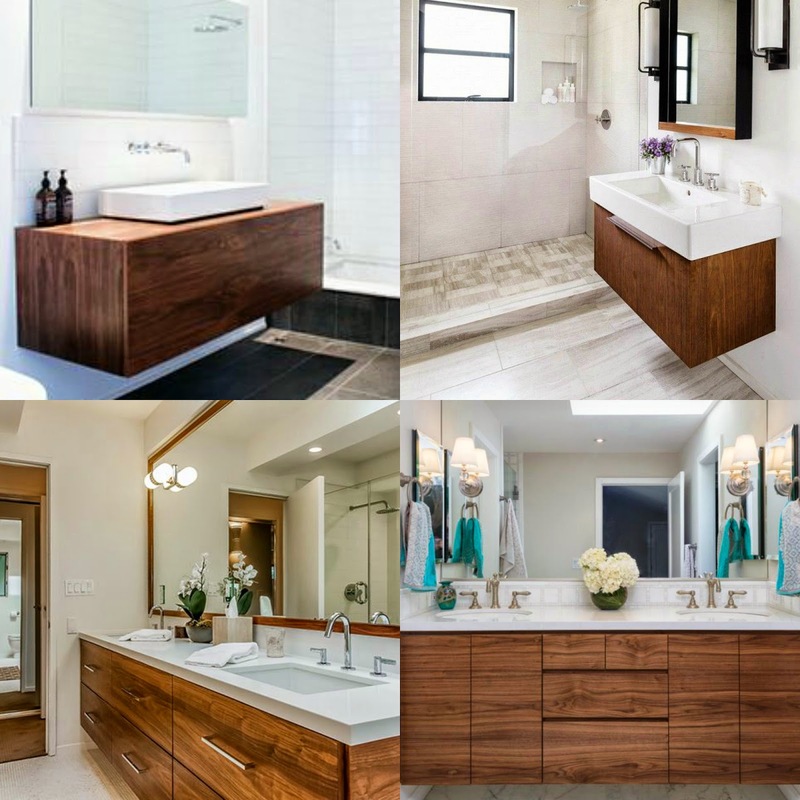 I love, love, love your choice of the walnut cabinetry. And to have the interior colour, aqua (turquoise) in the tower is a nod to your favourite colour! As I decorate our bedroom I'm finding it is a colour I am turning to more often. After living in a house for twenty some odd years with lever handles and now living in a house with two handles, I much prefer the two handle faucets. 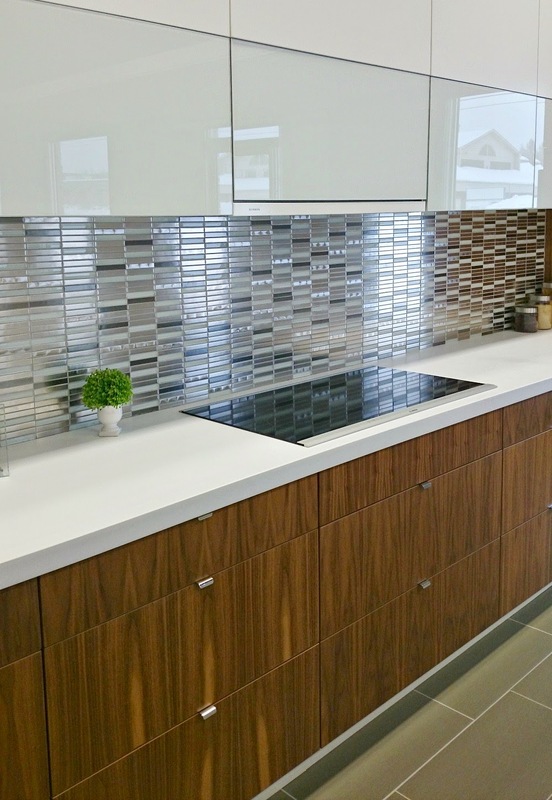 Have you considered a Cambria counter top. Ours has got lots of sparkles in it! I love that bathroom with the aqua tower! Not sure I'll be doing that, but I liked the layout of that, with the vanity floating and the tower fixed. But there needs to be some aqua, for sure! The sinks will be a fun touch, but then I'll rely on accessories for my other colour fixes – art, towels, shower curtain.I am team turquoise so I love hearing that you're decorating with it more!You prefer two handled faucets? Hmmm. Is there a functional reasons, or for aesthetics? I much prefer the look of two handled faucets so I am very amenable to having my mind changed on that.I just Googled Cambria – pretty! They are quartz, right? They have a much more natural look than some of the speckled quartz samples I've seen. I don't think anyone in town sells them because I haven't come across any samples in my searching. I will look further into it, though! I think my comments get eaten Tanya! I wrote a long one on this one.. and a different post and don't see them!Glad you like the stone! IT's gorgeous! Oh no! I'm so sorry about that! I hate that you've taken the time to write something and it disappears. That is so annoying, I know. I don't know where they go. Sometimes I am slow to approve them, but I approved the one you left on the counter top choice post shortly after you left it. I checked the spam filter and don't see any other comments from you. I think blogger is just the worst sometimes, but I'm too scared to move to WordPress. I have to admit that sometimes I read a blog post and then comment on that person's IG just because it's easier.